Conversation starter: Did you know that God talks about fast food in the Bible? Read Exodus 12:1-13 and 16:1-8 ahead of time, so you’ll know what you’re talking about. When the time came for God to rescue His people, the Israelites, from their captivity in Egypt, He knew that they would have to pick up and go IN A HURRY. There would be no time to pack. No making sure all the kids had shoes on. No charging the iPad so they would have a movie to watch in the car. So He gave specific instructions to them ahead of time to get them ready. He told them in verse four to determine in advance exactly how much lamb to cook based on how much each person would eat at one meal. No waste, because He knew they wouldn’t be there to eat it. He told them to roast it and make bread to go with it. This is also important: He told them to make bread without yeast. Why? Because bread without yeast doesn’t need time to rise! They needed a meal they could make and eat quickly. It should be a relief to us as moms that God understands eating on the run. All those times you felt guilty about throwing a bag of food toward the hungry hordes in the back seat at the McDonald’s drive-thru, God totally got it. Although God gave specific instructions about what they were to eat and how to cook it, His focus was not on the food but rather on what purpose the food was going to serve. It was fuel for the road. That night, the Lord would pass through Egypt and slaughter the first born in the houses that weren’t covered in the blood of the lamb. He knew His people needed to be able to run, and run fast. And when they ran the next morning, they did so with no extra food as baggage and no waste left behind. Do you know what food they DID take with them? That unleavened bread dough! And it was compact and firm enough to pack into troughs on their shoulders because it hadn’t risen. It wasn’t some doughy mess to carry through the desert. But then we get to Chapter 16. They were camping again, in a place called the Desert of Sin. (Do you think that’s a coincidence? Because I don’t.) And after a few weeks, the people started to grumble and complain. Why? Because they weren’t satisfied with their food situation! The same people who had walked through the Red Sea on dry land were irritated and said, “If only we had died by the Lord’s hand in Egypt! There we sat around pots of meat and ate all the food we wanted, but you have brought us out into this desert to starve this entire assembly to death.” They had been in the desert for 2 ½ months by that time. But, and this is your “aha” moment, do you know how far their homes in Egypt were from the land that God had promised them? TEN DAYS’ WALK. Yup. Ten days. What were they doing this whole time? They were camped. They were sitting by the sea. Waiting on something to happen. Waiting to see if anyone was going to take charge or if anyone was going to give up and go home. Maybe even waiting on God to show up. They were wasting time hemmed in by a sea that God could move out of their way if they stepped in with a little faith. We won’t go into the rest of the story now, how they disobeyed God and built an idol and ended up circling aimlessly in the desert for 40 years. Frankly, we don’t have time to catalog all the ways the Children of Israel messed up. But suffice it to say, they could have arrived in the Land of Milk and Honey while they were still burping lamb and bitter herbs. God had given them a quick meal to focus them on the task ahead. He had given them fuel for the journey He had planned for them. It’s not His fault that they chose to take a totally different journey. So often we view food as the END to a day. The time at dusk when we sit down and take a load off and rest and stuff ourselves as a reward for surviving through a hard day. What would happen if we viewed it as fuel for the journey instead? What if we asked God what He has for us to do and looked at food as a tool that helped us serve Him more effectively? What if, instead of feeding our families because we “have to,” we turned our tables into mission fields to reach our children. What if we used food to minister? What if we used it as fuel for ministry? Would it change the foods we ate? Would it change who we cook for? Would it change how we felt about cooking? My dad used to say this prayer at every meal: “Bless this food to our bodies and our bodies, Lord, to your service.” We used to make fun of him because he said it every time. But it is truth and bears repeating. Food fuels our bodies to serve God. And in doing so, food becomes a holy act of worship. And every dinner becomes a Passover meal. My dear friend Amarilys showed me this recipe as a great “cold night comfort food fast” solution years ago. I’ve modified it a little to make it even quicker and taken it down to five ingredients. So if you don’t like it, it was probably something I did! 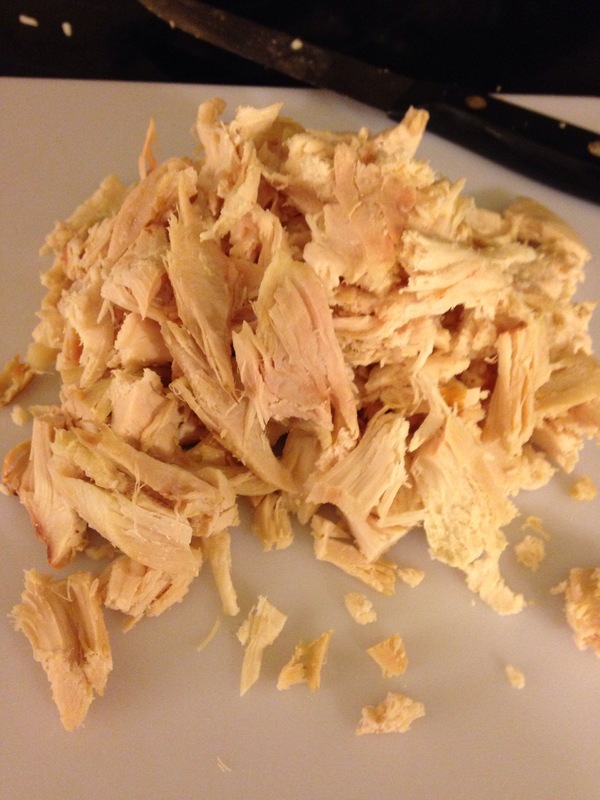 Cut two big handfuls of chicken off of the rotisserie chicken. Chop. 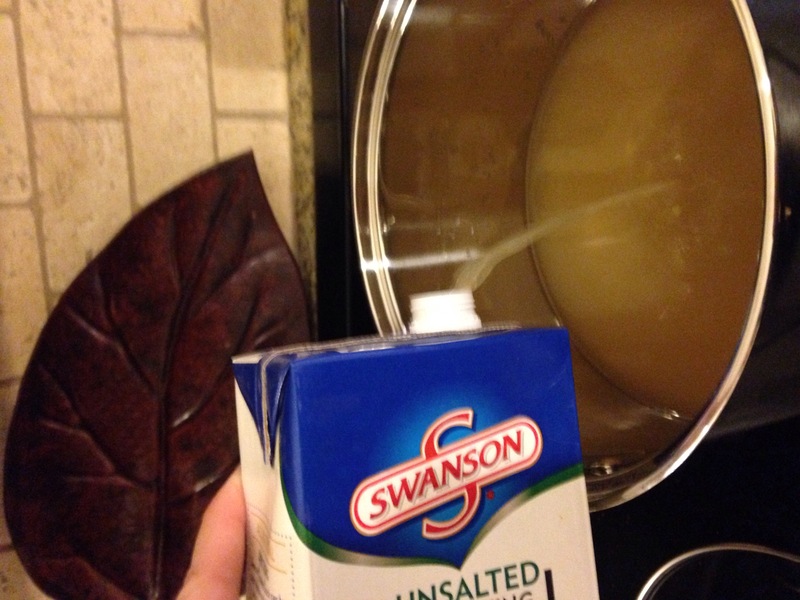 Pour a carton of chicken broth into a soup pot. 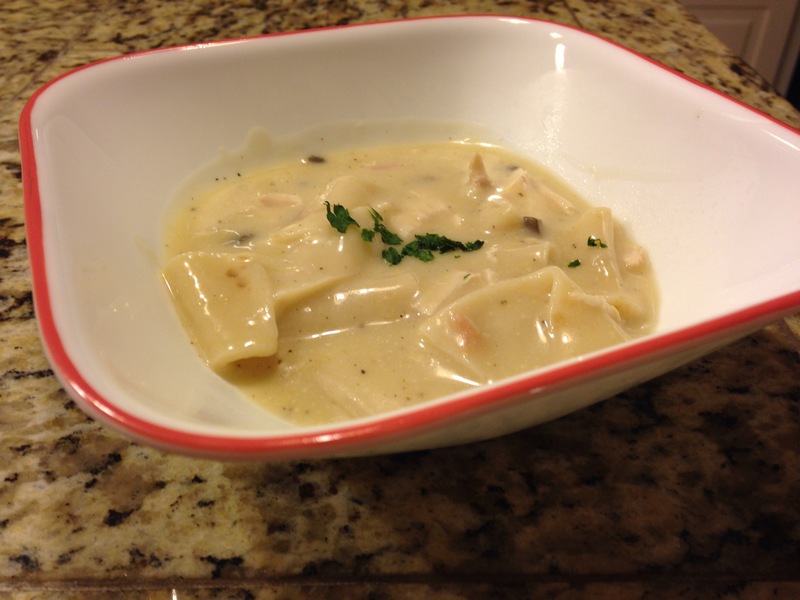 Whisk in a can of cream of mushroom soup and a can of cream of chicken soup. Make sure these are well blended. Bring this just to a boil. 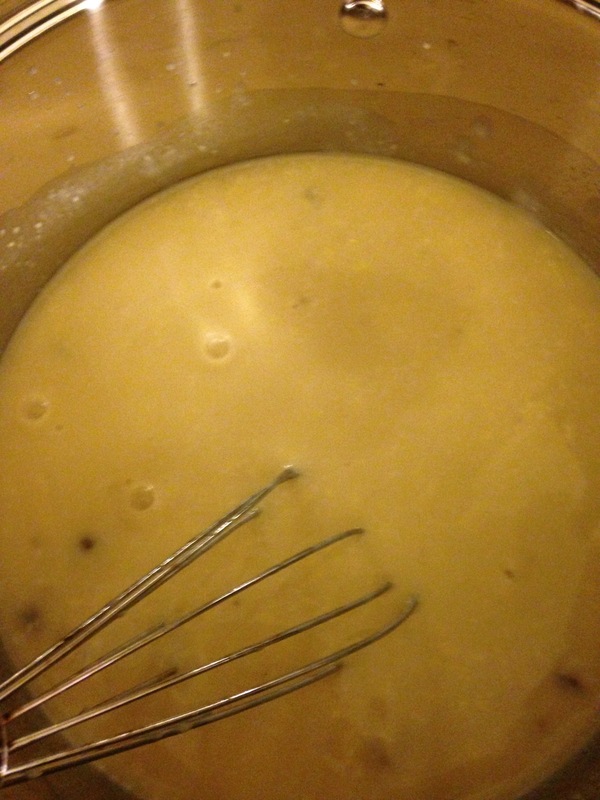 Continue to stir so that the cream soups don’t burn on the bottom of the pot. 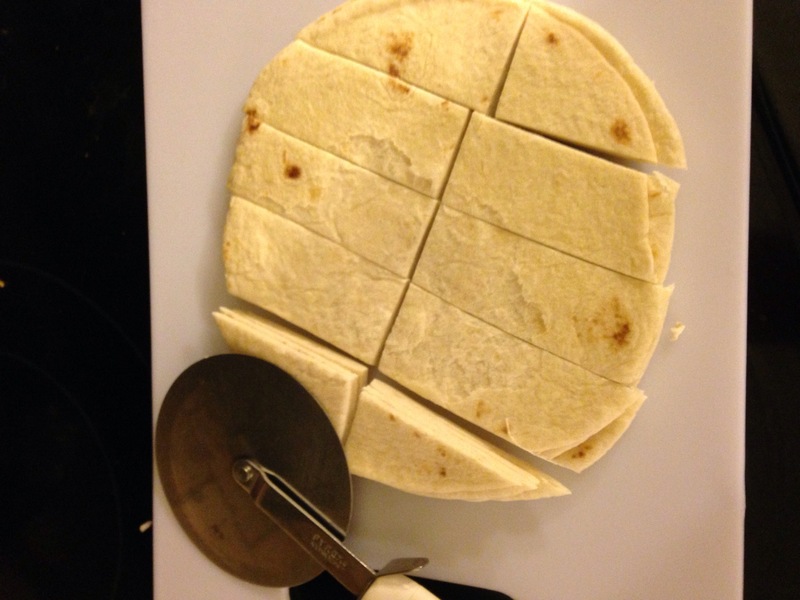 Cut the tortillas into strips with your pizza cutter. 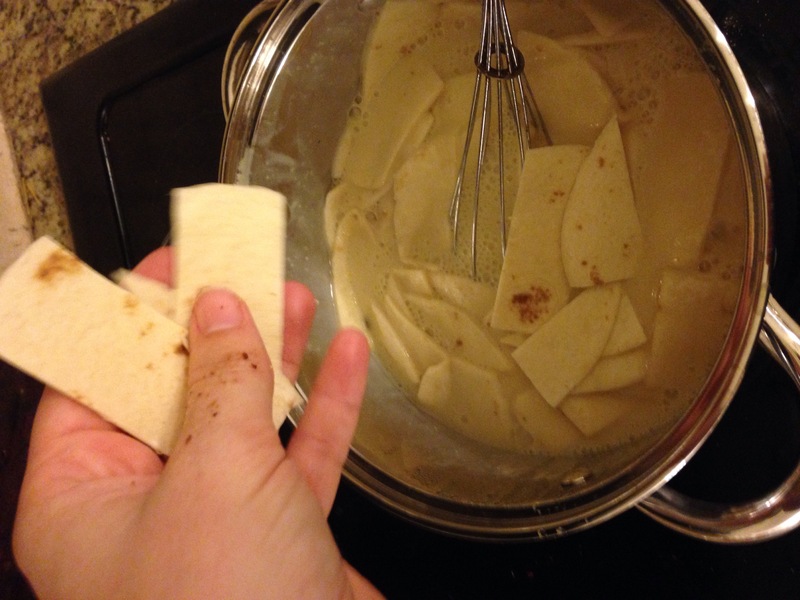 Continue to stir while you drop the tortilla dumplings in one by one (I use a fork for this, to keep them separated). 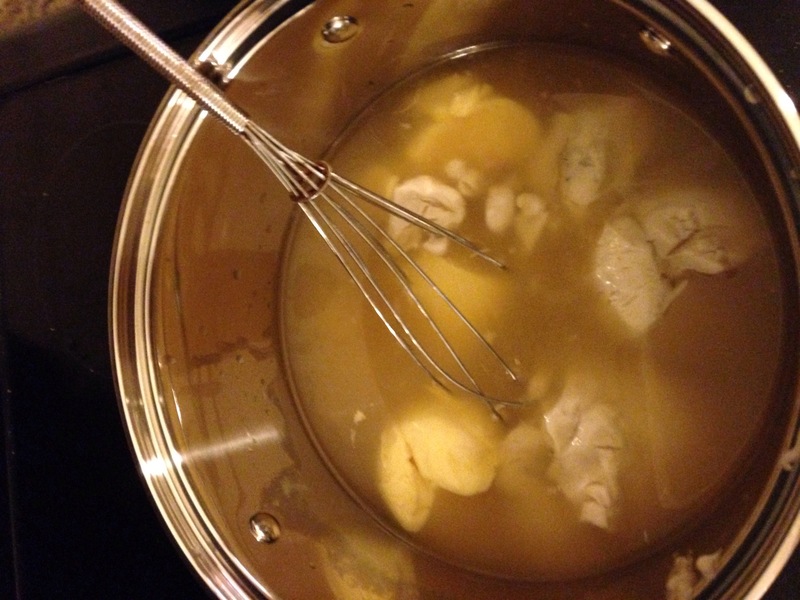 Drop in your two handfuls of chicken and cook until the dumplings are, well, dumpling mushy. Rub olive oil and salt and pepper on both sides of the steak. 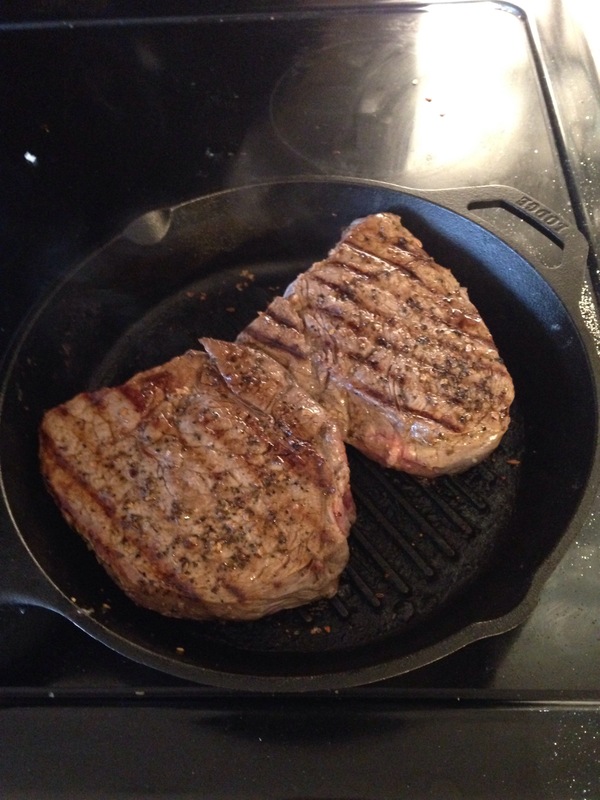 Put skillet on stove top and heat on high heat. Turn on oven to pre-heat to 400 degrees. 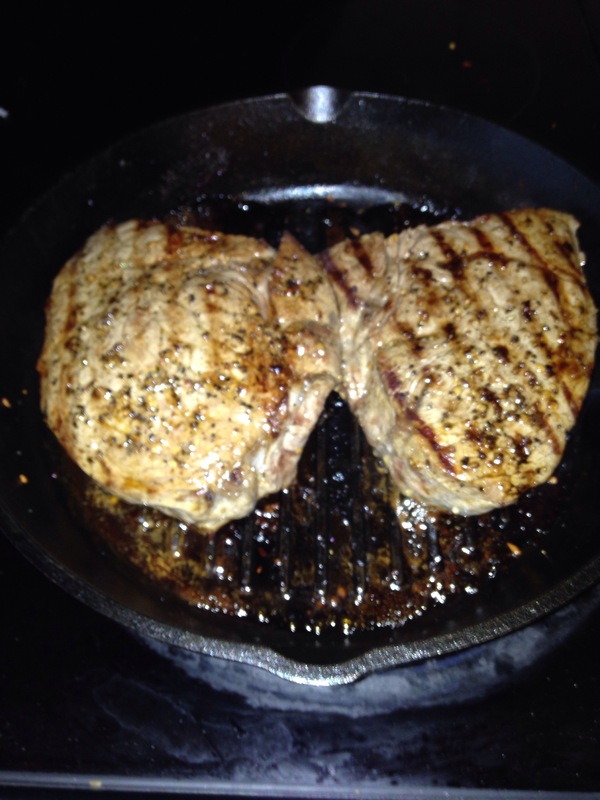 Place both steaks in skillet and sear one side. 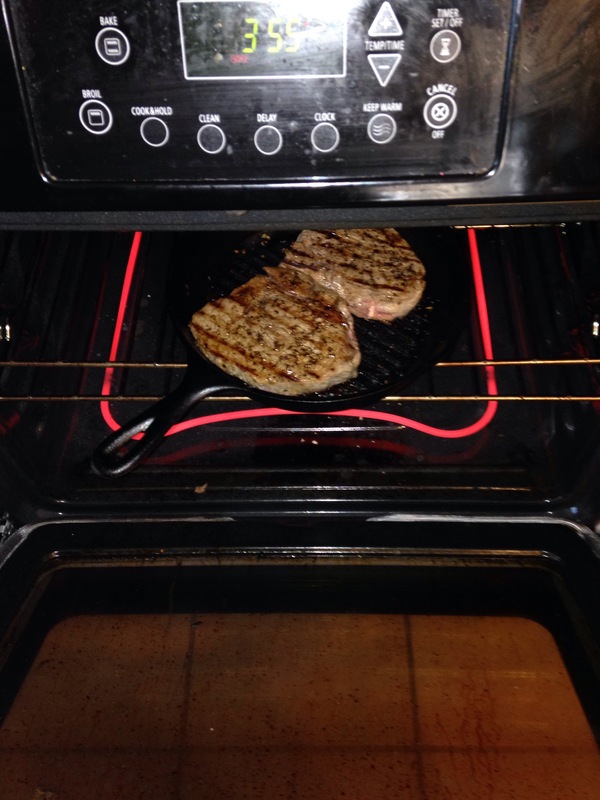 Flip both steaks over and immediately turn off burner and place the skillet in the oven. This is a good time to use the hand test method we learned in class for determining when steaks are done. Your steak should be just as firm as the fatter parts of your palm. Reminder: rare is where your thumb meets your hand, medium is just below that on the fattest part of your palm. You want your steak to be medium. 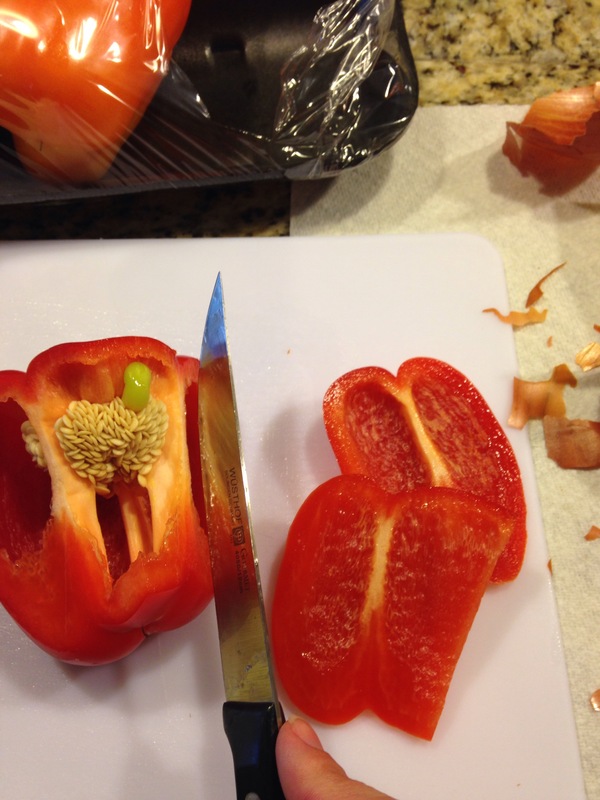 While your steak is in the oven, cut your bell pepper using the method we learned in class. Remember: cut around the sides and throw away the middle so you don’t have to de-seed. Tuck a paper towel under the end of your cutting board and scrape your waste onto it for easy disposal. Take your steak out of the oven and turn it off. Heat a little oil in a skillet and cook your peppers and onions until soft. Slice your steaks and throw the slices in with the peppers and onions. Don’t stress out if your steak is underdone when you cut into it. You can just cook it longer in the peppers and onions. Sprinkle with 2 tablespoons fajita seasoning and 2 tablespoons lime juice. 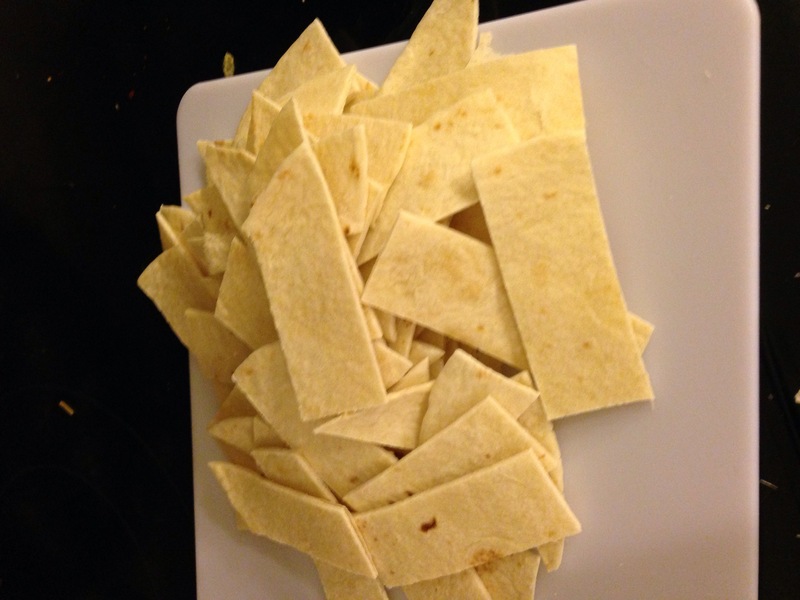 Serve on soft flour tortillas with cheese, lettuce, and homemade salsa. Use the palm of your hand to test the degree to which a steak is cooked, without cutting into a steak and losing all the delicious juiciness. Rare is between your thumb and index finger. Medium is slightly lower, at the base of your thumb on the fattest part of your palm. When the firmness of the meat matches the firmness of your hand, it’s done. 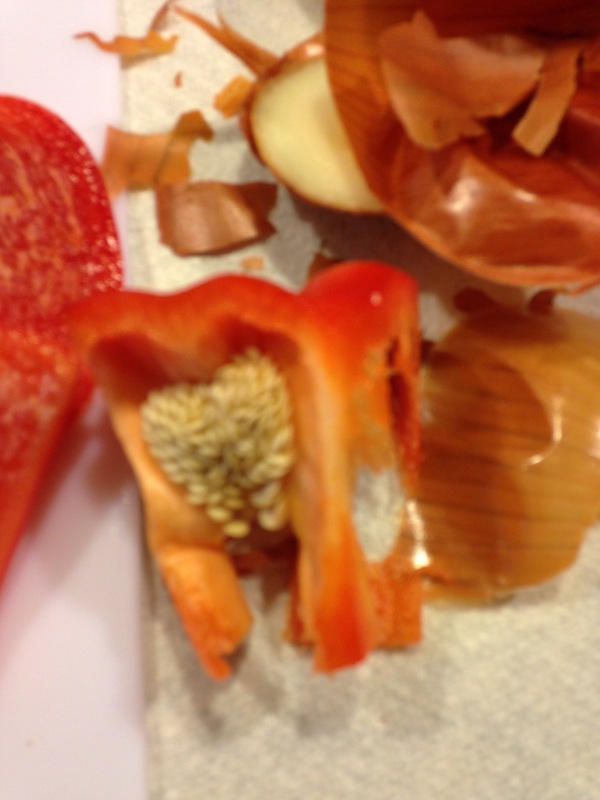 When you’re cutting any kind of pepper and wish to leave the seeds out of your recipe, lay the pepper on its side and cut around the outside. Then cut off the bottom, leaving the stem, top and seeds intact. This is a much easier way to seed peppers and, when you’re chopping jalapenos or serranos, can help to keep the heat down. If you want to save time and cash, repurpose ingredients for more than one meal during the week. If I were cooking this meal on a Monday, I might also cook the shrimp creole on Thursday of that same week. Instead of using the seasoning mix, I might just chop some extra onions and peppers on fajita night and use those for the creole also. 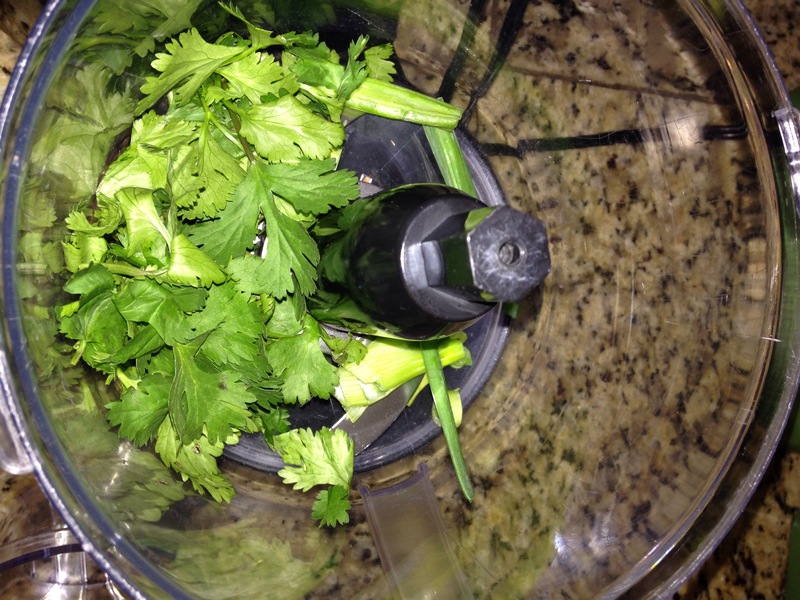 In between, I would make some Asian food using the rest of my lime juice and cilantro. Four ingredients, three meals. Of course, any protein may be used in the place of steak. Simply skip steps 1-6 of the recipe and brown some chicken breasts (cut into strips) or quickly saute some shrimp in the skillet. Then carry on at step number 7. Could not be easier. 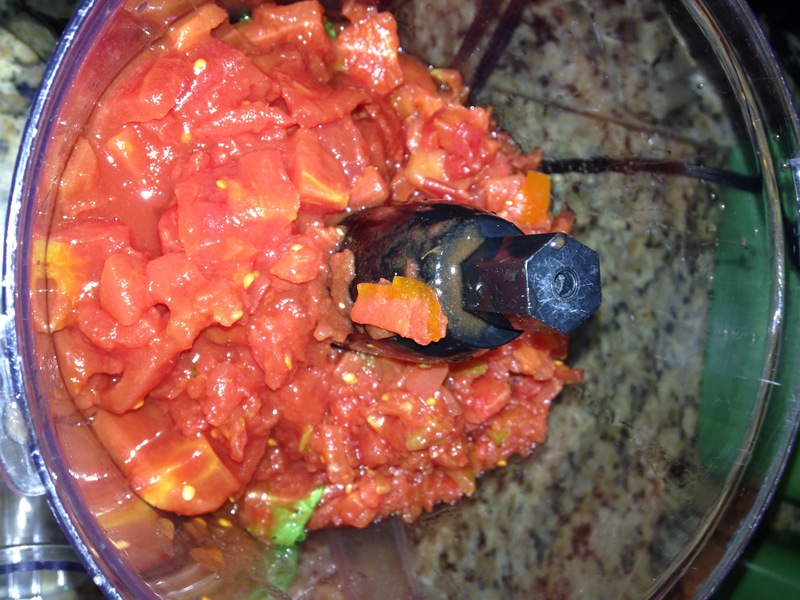 Open both cans of tomatoes (Rotel and diced), dump their contents in the food processor. Throw in a handful of cilantro (no need to chop) and pulse. Add a teaspoon of lime juice and a teaspoon of garlic salt (just do it to taste, no need to measure. Barely cover the bottom of your soup pot with olive oil, turn burner to medium high. Pour in two thirds of the bag of frozen seasoning blend. 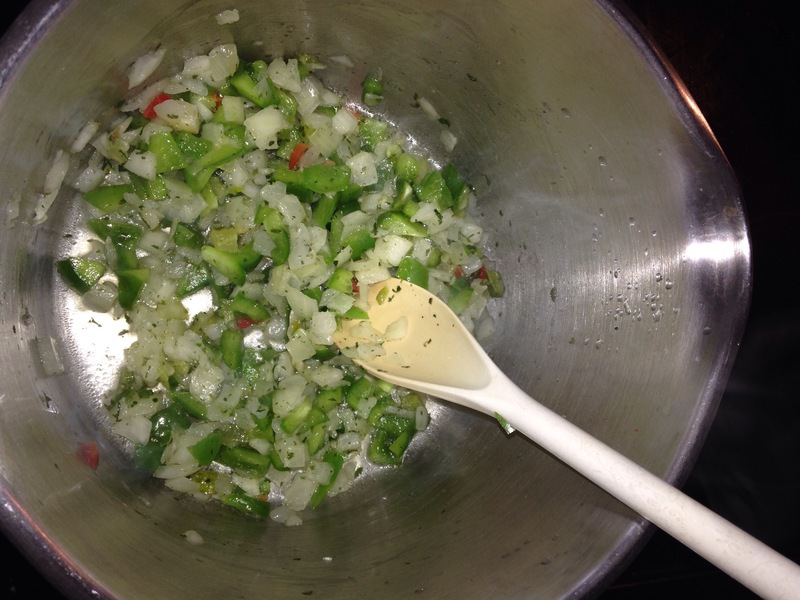 The seasoning blend contains onions, bell peppers, celery and parsley. Keep stirring while you cook this blend, approximately six minutes. Cook just until the onions and peppers are soft. This is your delicious base. Treat it with respect and cook it gently. 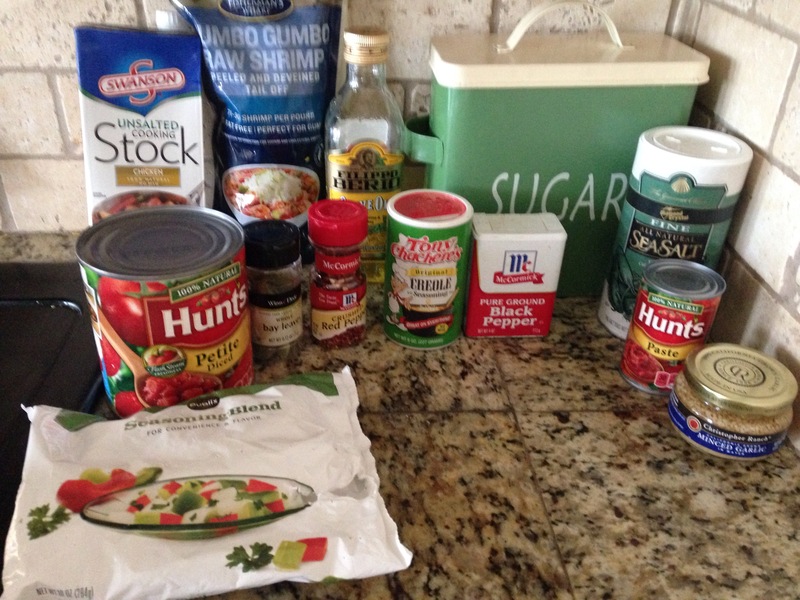 Open your cans and pour in the tomatoes and 2 cups of chicken broth. 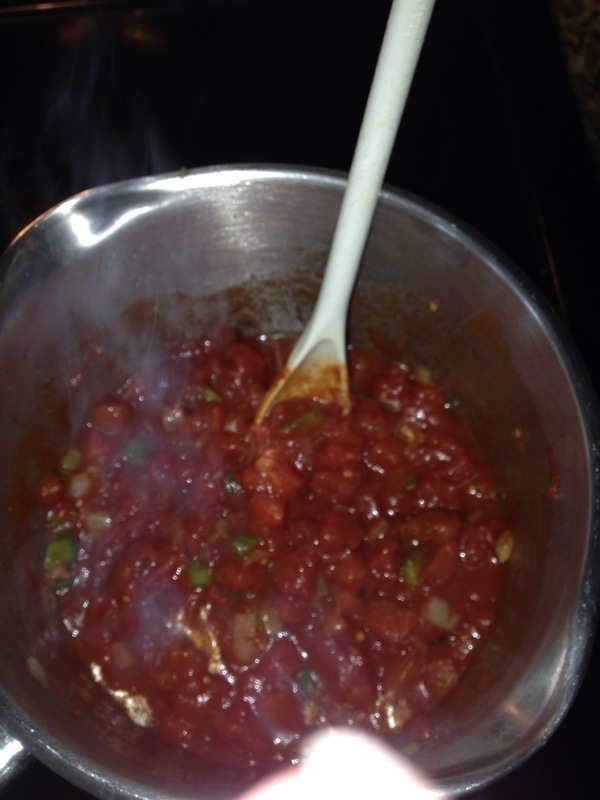 Use a teaspoon to get all the tomato paste out of the can. Put in all your spices except for the cocoa. You don’t have to measure exactly (you can’t mess this up), but if you’re a Type A and you want measurements, here they are: 1 teaspoon of garlic, 2 teaspoons sugar, one whole bay leaf, ½ teaspoon salt, ½ teaspoon pepper, ½ teaspoon red pepper, 1 teaspoon Cajun seasoning. The only thing left is the cocoa. You just have to trust me on this ingredient. Use it. It will change your life. 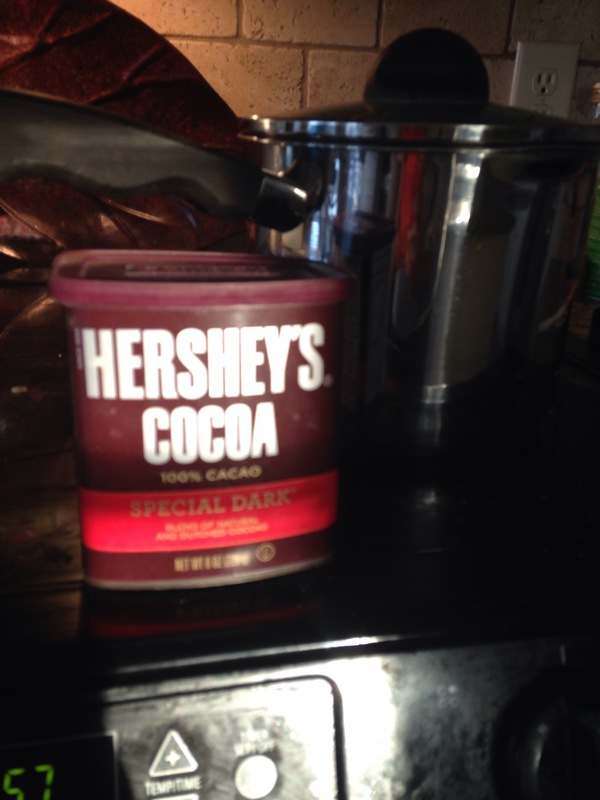 Measure out 1/2 teaspoon dark cocoa powder and sprinkle it all over the top of the contents of your soup pot. Spread it out to make sure it doesn’t clump. Pour in your shrimp and put the lid on. Cook about 5 minutes until the shrimp are firm and white. Cocoa powder can be used in any tomato recipe to round out the sharpness of the tomato taste and provide a base for the tomato acid. It makes tomato dishes taste like they have cooked longer (a must for quick cooking!) and that the flavors have had a chance to “marry” and round out naturally. Vegetarians sometimes use it to give a depth to tomato dishes that meat would normally provide. 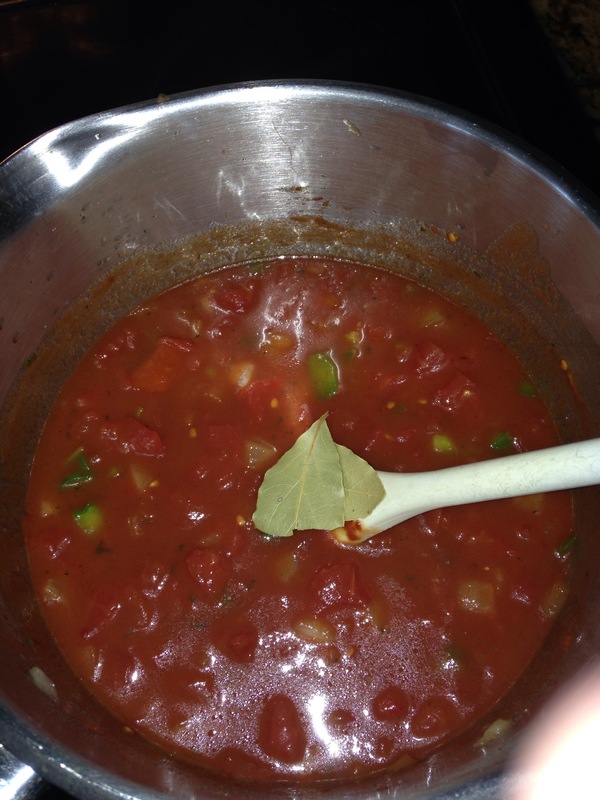 Try a teaspoon or so in your spaghetti sauce or chili. I promise you’ll never leave it out again. 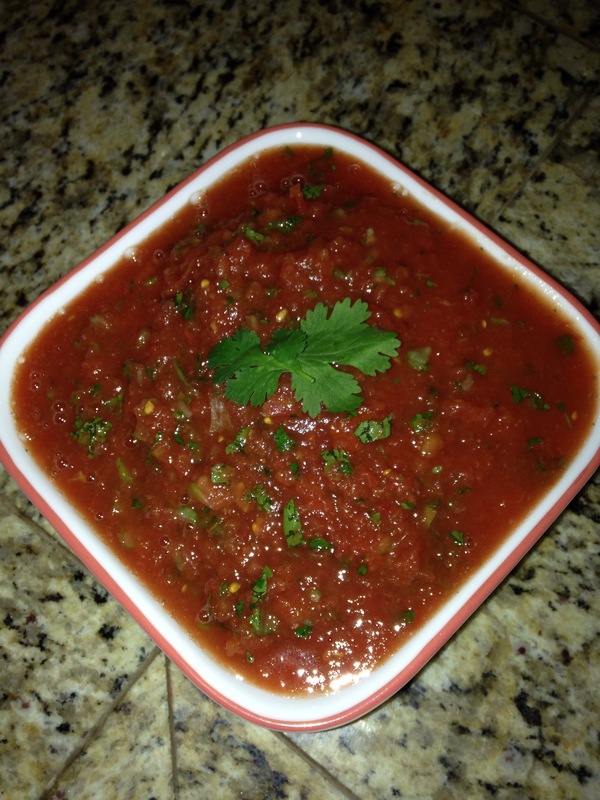 Tomato paste: use it to add tomato flavor without adding more liquid to dishes. Has a darker, sweeter taste than sauce. 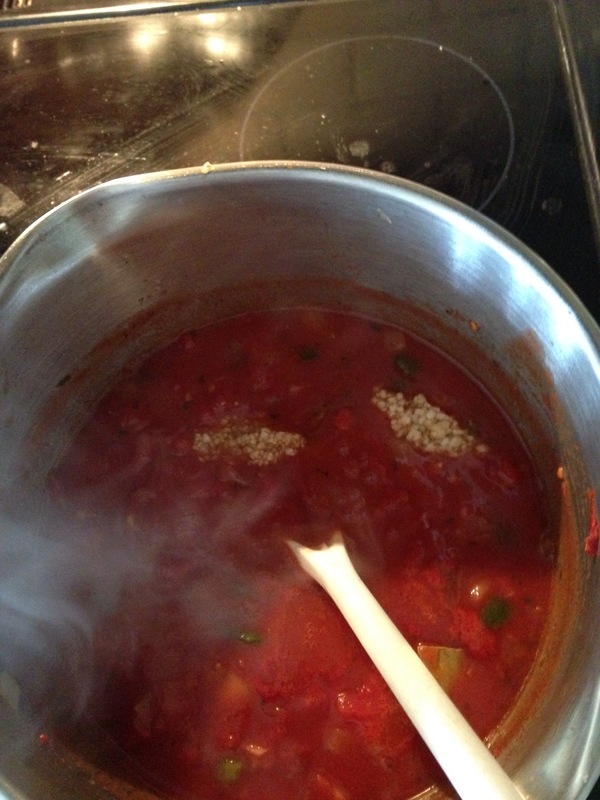 If you make a tomato dish that seems too watery, use tomato paste to thicken it. If your family isn’t “seafood friendly,” leave out the shrimp and throw in some rotisserie chicken and cooked sausage for a “turf” alternative. Or do what I do and dip the kids’ helpings before you add the shrimp to the pot, and give them some leftover protein from the night before on the side of their “rice and tomatoes.” Beats making two separate meals for the grown-ups and kiddos.